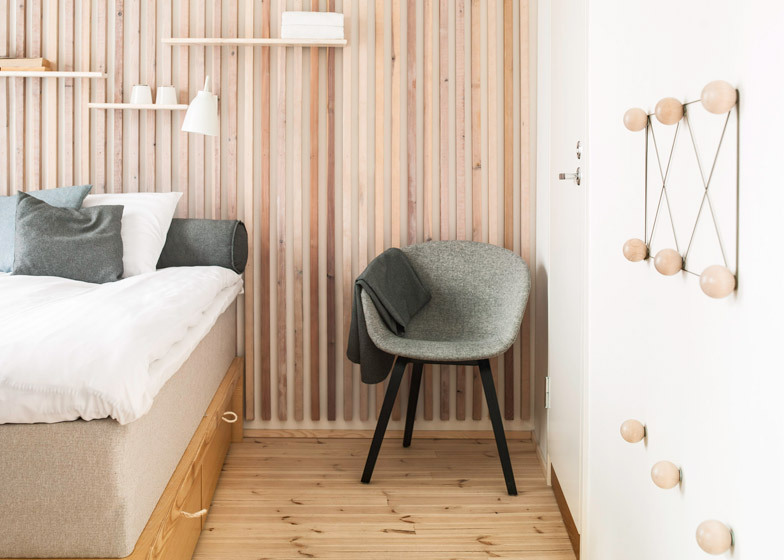 Helsinki-based Studio Puisto used hanging basket seats, strips of timber and potted plants for the interior of this 20-room hotel in Tampere, Finland (+ slideshow). 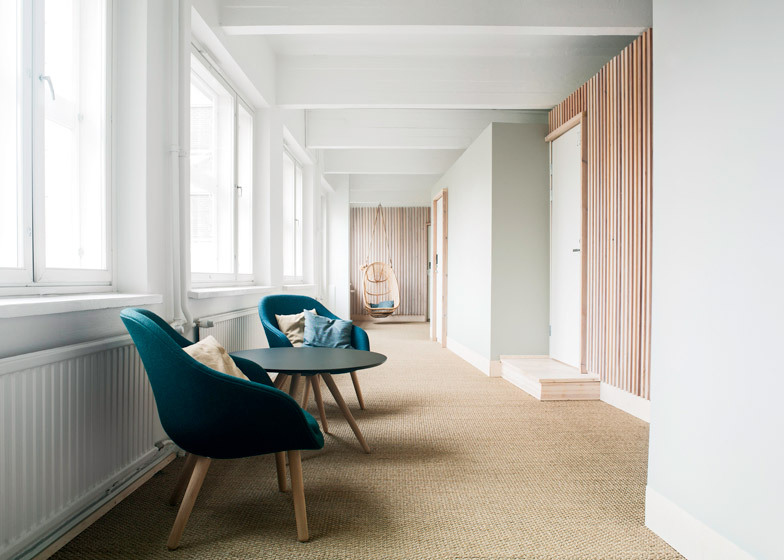 Located within a converted industrial building, the Dream Hotel was designed by Studio Puisto to accompany the pre-existing Dream Hostel in the same building, offering an additional 20 boutique suites with en suite bathrooms. The architects designed the rooms to be fairly basic to keep costs low, focusing on creating private sleeping space. 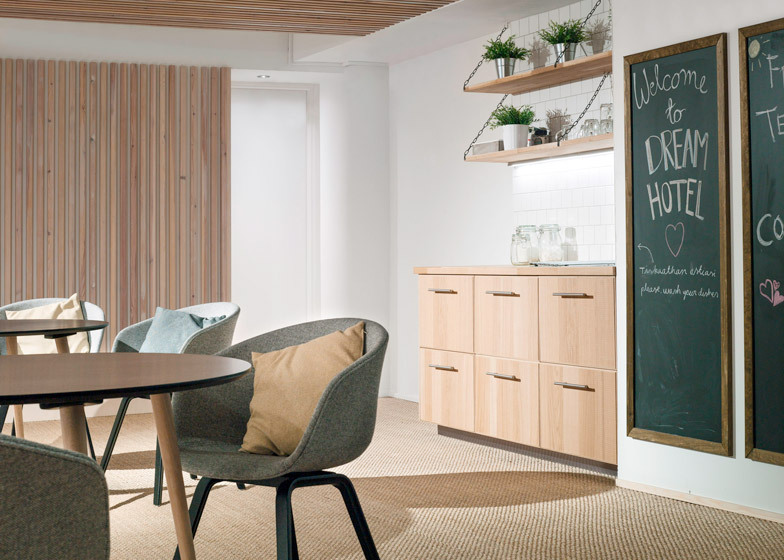 Seating is provided in the hallways, which are designed to act as communal living spaces. This arrangement was also intended to integrate some of the ideas of shared space from the hostel into the hotel. "Rather than fulfilling the conventional hotel standards, it tries to offer everything that a guest really needs for a good nights sleep," they said. Half of the rooms – those with double beds – have street-facing windows, while the twin rooms, positioned off-grid in the middle of the complex, have clerestory windows that bring in light from the corridors. "The open character of the industrial building is strengthened by placing the rooms as separate units in the open space," said the architects, "thus creating a feeling of being in a public park in between individual volumes." 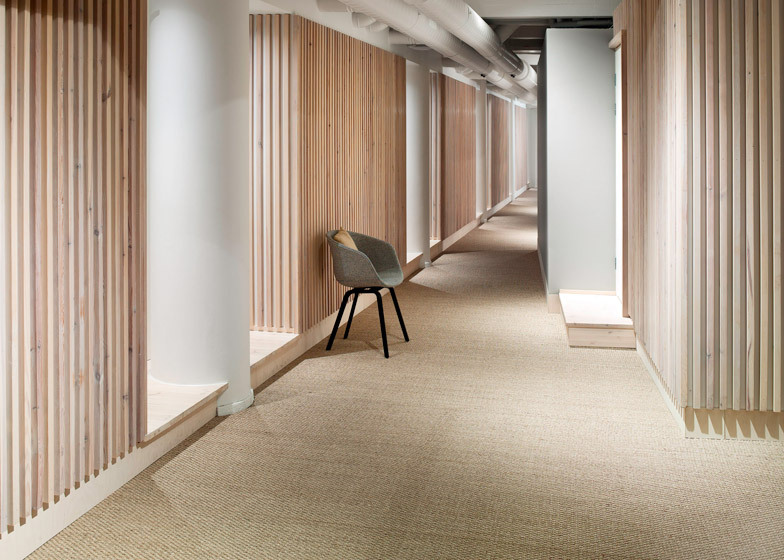 Wooden cocoon chairs are suspended from the ceiling on lengths of rough-fibred rope in the corridor that runs outside the bedrooms. 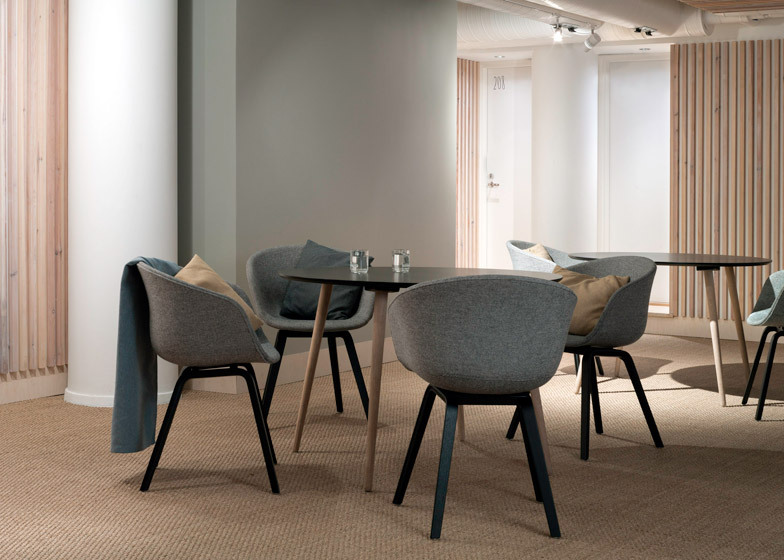 Soft furnishings with turquoise and evergreen coloured textiles contrast with the neutral tones of the space, which has a course-textured beige carpet. Slim strips of multi-tonal timber line the white and grey walls to mark the bedroom entrances, and are used inside to stripe the walls behind the beds. Timbers criss-cross the white painted ceilings to give a coffered appearance. "To create a peaceful warm atmosphere and at the same time use materials responsibly, there is an extensive use of natural materials," said the team. A meeting room is situated on one side of the floor plan, and there is a communal kitchen that is also available to hostel guests. The hotel owners hope these features will add value over a conventional hotel experience. The Dream Hotel was recently selected by British tabloid the Daily Mail as one of the top ten "poshtels" in Europe. Photography is by Patrik Rastenberger.